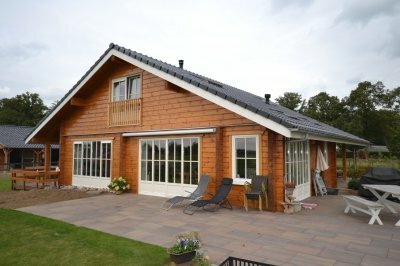 It is an individual 80m2 bungalow built from logs in Holland in year 2015. This house with exclusive design was built from 160mm pine logs which were grunted and painted white. The roof is designed with ceramic tiles and windows are plastic. The house has three rooms. Two of them are bedrooms with separate bathrooms. And it has open plan kitchen and sitting-room of 36,2m2. 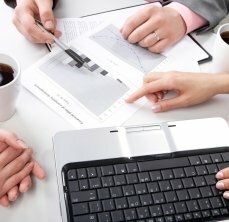 It is an individual residential 170 sq. m. timber house. 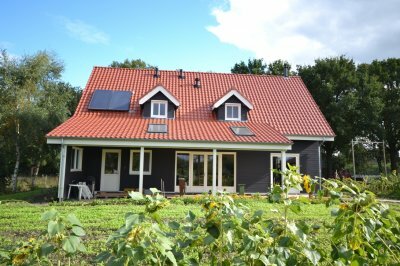 It was built in 2012 in Sinderen city, Holland. The construction of the first floor is built from pine timbers of 200 mm thickness additionally insulated 100 mm from the inside. The second floor is built from wooden timber frame walls and roof panels insulated with 150 mm thickness mineral rock wool. 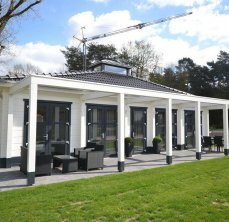 The roof is designed with varnished, ceramic, Holland tiles. Qualitative, hermetic, and ventilated wooden windows of three chambers protect building from big heating losses. Inner house decoration is done from Siberian fir panels. The building is heated with geothermal heating; hot water is prepared by solar cells. 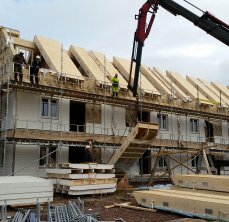 Individual two-storied 230m2 timber-frame house was built in year 2015 in Sweden. 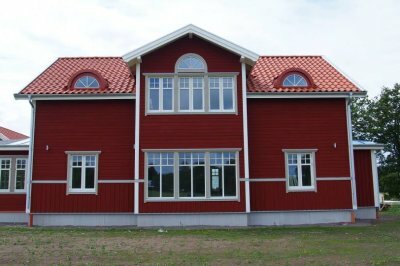 It is designed by classical Swedish standards. The outside wall reaches the width of 395mm. All exterior walls are insulated by three layers of mineral rock wool. Wooden panelling is painted two layers RAL. The roof construction is made of wooden panels and is insulated by 325mm mineral rock wool, which is covered with ceramic tiles. Two chambers ventilating wooden windows protect house from heat losses. The house has nine rooms. The second floor has a terrace of 20m2. It is an individual residential house of 180 sq. m. constructed in Lithuania. It was built in 2011, Venlo-Venray city in Holland. 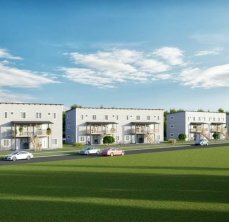 The construction is produced from 150 mm insulated walls and 200 mm roof panels. 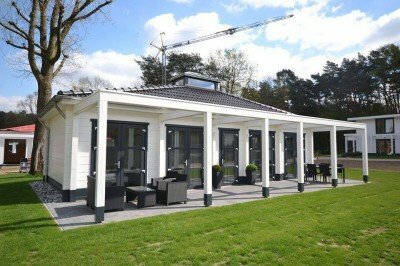 The roof is designed with classical, ceramic, Holland tiles. Facade decoration is done with qualitative and long-lasting cedar panels. Qualitative, hermetic, and ventilated wooden windows of three chambers protect building from big heating losses and create cozy atmosphere. Inner decoration is done from Siberian fir panels. The building is heated with geothermal heating; hot water is prepared by solar cells. © 2000-2019 Domus Export. All Rights Reserved.